Thank you to everyone who bought a ticket for our teddy bear raffle at our Licensees Fun Day Out. I popped by the Hospice to hand over a cheque for £465 last month and took the opportunity to hear about the wonderful work they do in our community. the hospice, and it’s so nice to see so many people on a weekly basis, throughout the area and beyond, raising funds for such a worthwhile cause. Their Chairman, Richard Davis, said, “I would like to take this opportunity, on behalf of the patients and their families who have relied on our services, to thank our supporters and volunteers who havegiven so generously and brought such an abundance of kindness and skill to the organisation that has been invaluable. 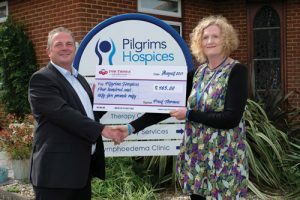 With your continued efforts, we will work together to ensure that the Pilgrims Hospice promise of care and support, at what can be such a difficult time, will be there for the next family that needs us.” 72% of the hospices’ funding comes from public contributions and with the demand for their services growing, the amount that need to be raised rises. https://www.ivor-thomas.com/wp-content/uploads/2017/09/Pilgrims-Hospices.jpg 333 500 High Profile Limited https://www.ivor-thomas.com/wp-content/uploads/2016/11/Ivor-Thomas-logo-web-retina.jpg High Profile Limited2017-09-27 16:35:322017-09-27 16:35:32This is how much you raised for Pilgrims Hospices! A cuddly incentive for Punch publicans with AWP machines! Nathan to the rescue!